Badezimmer mit Badewanne / Dusche, WC und Waschbecken. Property very nice everything we needed to make our stay pleasant. Thank you Bill for your kind review. The lighting leading to the apartment was reported and should have been resolved by the site electricians before your arrival, I apologise for this. Thank you again for your custom and look forward to having you stay again soon. L'appartement est vraiment très bien situé et le balcon est vraiment très agréable (vue sur la piscine et dunes) à même pas 3 minutes à pieds des commerces, supermarchés, restaurants. Nous avons passé un super séjour dans l'appartement qui était très propre et fonctionnel, la plage est à 10 minutes et nos filles ont appréciés les piscines de la résidence, un parking est juste en bas de l'appartement ce qui est vraiment appréciable car le complexe est vraiment très grand! Serviette et draps fournis. Nous avons été très bien accueillis par Keith et son mari! La wifi marchait très bien et Ron à été très réactifs à nos échanges de mail! Thank you for your kind review, wonderful guests! Merci pour votre avis aimable, vous avez été des invités merveilleux et avez laissé l'appartement immaculé après votre séjour. Nous espérons que vous reviendrez dans un avenir très proche. It was great to have UK TV but there wasn't a comfortable chair to watch it on. There was only a folded up bed which was very uncomfortable. The balcony was very nice with good views of the pool but the stairs to the apartments were poorly maintained evidenced by the amount of tree droppings which were everywhere. Also the approach to the apartment at night was positively dangerous as the lighting was poor and non existent in the passageway to the door. Beds were comfortable but we could have done with a bit of heat in the apartment particularly in the evenings. Thank you for your valued feedback, however we are disappointed to learn our apartment did not meet with your expectations. We always attempt to give an accurate description as possible including photos in our HomeAway listing so guests can make an informed decision to book or not. We were surprised you found the pathways as described, they were immaculate when we were there mid January as expected and the two-way exterior stairs, paths and hallway lights were working. Thank you for bringing this issue to our attention, your comments will be forwarded to the community admin team to action as the pathways and lighting are their responsibility. Finally, thank you for staying with us and sincerely hope you enjoyed what Corralejo had to offer. Would recommend this apartment if you want to be close to everything. Had a great week at Ron & Ann's apartment. From the time we booked Ron & Ann were very helpful and always replied promptly to any questions we had. Smooth check in with Keith who met us at the apartment to show us round. The apartment itself had everything we needed including English channels on the t.v. 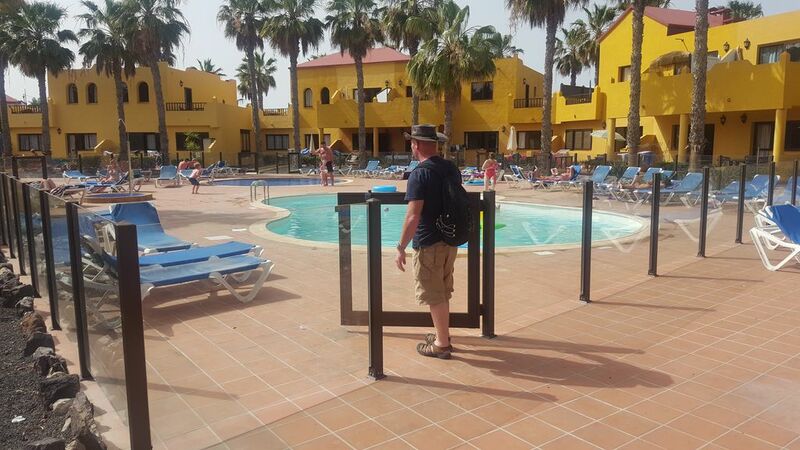 It was very close to the bars restaurants and shops in Corralejo, and10 minutes walk to the beach. Would stay there again if we go back to Corralejo. Thank you Ken for your wonderful review, so very much appreciated. Ann and I were delighted to have you and Linda stay with us and sincerely hope one day you will return. This was my third trip to Oasis Royal complex & my first to Ron & Ann’s apartment. It’s a perfect spot close to the town & beaches but always quiet. Apartment was well equipped & comfortable. Big bonus was the UK TV/ Radio channels & very good Wi-fi. Thanks to Ron for all his help. Will definitely be back. Thank you for your lovely feedback Andy, considering we had issues initially with the service provider for the WiFi during your stay, your excellent communication with us helped me immensely with having it resolved. We look forward to having you stay again hopefully in the very near future. We had a great time at this apartment. It is very central and easy walking distance to the main street with all the shops and restaurants. Also very close to the beach. The apartment itself was very comfortable and the complex quiet and relaxed. Unfortunately, while there are 3 pools only one was open during our stay so was busy and we didn't get to use it. Communication with Ron/Ann and the apartment managers was really efficient and we had no problems at all. All in all great apartment in a great location. Thank you for your kind review Maureen what a shame the other pools were closed as normally its nice and peaceful around the pool where we are located. We had lovely feedback about you from our property managers and would love to welcome you back in the very near future. 10-15 Minuten Spaziergang zum nächstgelegenen Strand. 3 km zum Parque Natural de Corralejo mit seinen Sanddünen und ca. 7 km Strand. Die Entfernung zum Flughafen beträgt 41 km, die Fahrzeit zwischen 30 und 45 Minuten mit dem Auto. Der Fährhafen nach Lanzarote ist 2 km entfernt, 25 Minuten zu Fuß. ARMAS Linie Corralejo - Playa Blanca, Lanzarote 25 Minuten. Booking Notes: £50 non refundable deposit with booking. Balance payable in full 28 days before arrival. Breakages must either be paid for or replaced. Changeover Day: Change over days are flexible. Guests should vacate the property by 10:00am on day of departure unless prior arrangements has been made with the property management team on arrival.